Word the increasing competition in the Nigeria phone market, Innjoo are really trying so hard to gain ground and they just proved that with their latest device lineups. With the recently released Innjoo max2 and Max 2 plus, Injoo is surely going to give their competitors a run for their money. With more emphasize on performance, this two devices are going to be packed with the highest battery capacity you have ever found on any Innjoo device before. Both devices comes with the same spec except for the different screen size and battery Capacity. The Injoo Max 2 has a 5.0inch HD display and a 4,000mah LI-PO battery while the Max 2 Plus has a 5.5inch HD display and a 4,600mah LI-PO battery. The Innjoo Max 2 and Max 2 plus are powered by Media tek 1.3ghz Quad Core processor, a 1gb RAM, 16gb ROM and runs on the latest Android 5.1 Lollipop OS. The rear camera is 13mp while the front facing camera is 8mp. Both devices are now available on online and offline stores. 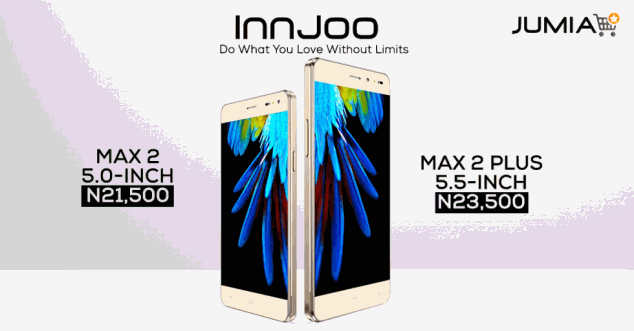 The Innjoo Max 2 goes for N21,500 while the Innjoo Max 2 plus cost just N23,500. To Buy From JUMIA Click HERE. To Buy From KONGA Click HERE.